Although she can’t remember the accident that took her left leg, the loss affects and motivates twelve-year-old Zoe Gottwald every day. 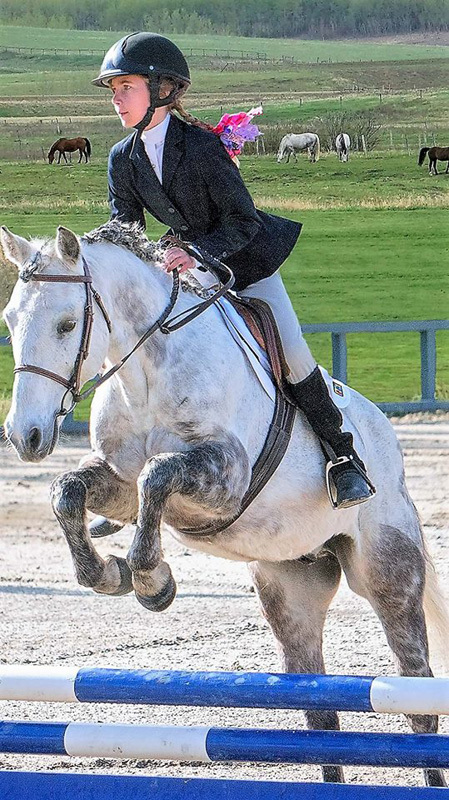 In living her best live, Gottwald competes in horse jumping and advocates for safety as one of the War Amps Child Amputee or CHAMP safety advocates. 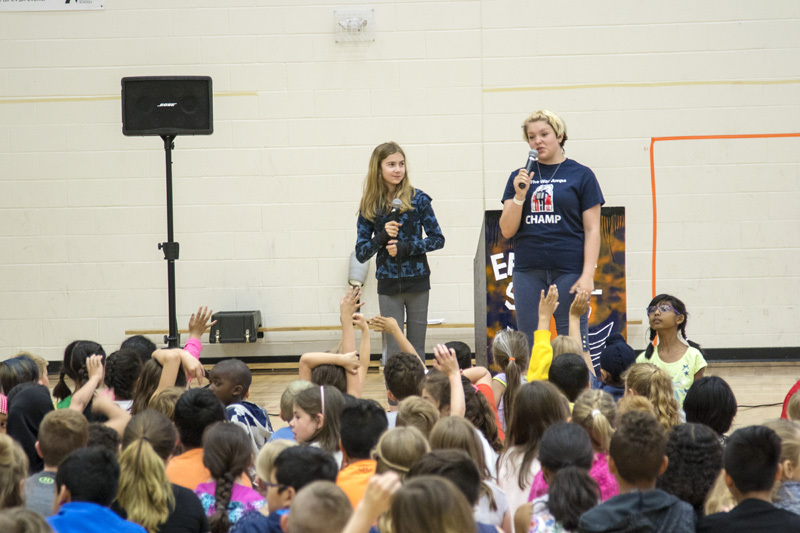 “It’s really important to me because I don’t want it to happen to other kids,” she said. To that end, Gottwald has been speaking about her accident since she was five years-old. This year Gottwald and her story are starring in the new War Amps video, PLAYSAFE: Don’t let it happen to you. She said that she wants other kids to know how important it is to be safe on farms, and around highways and train tracks. “You could have an accident like what happened to me,” she said. “I don’t want other kids to lose their legs or limbs or anything because of not playing safe,” said Gottwald. 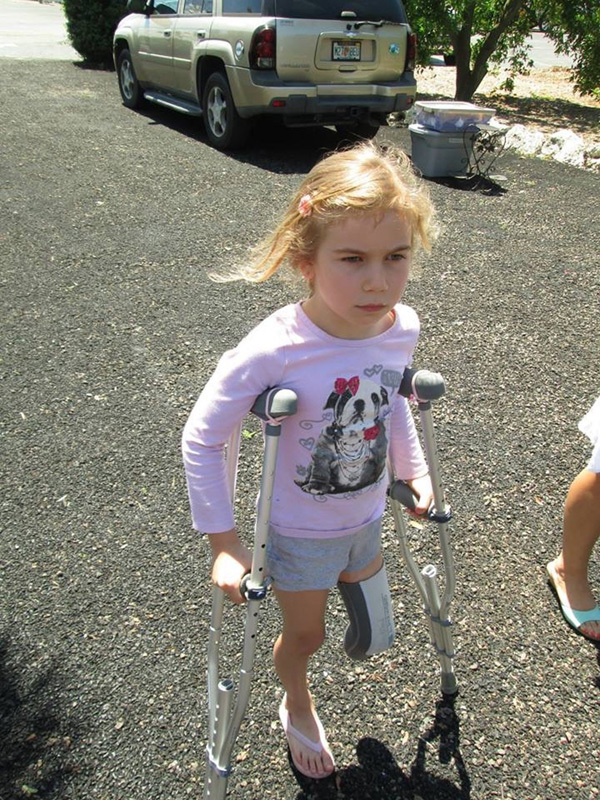 She was four-years-old when she lost her left leg below the knee. Gottwald was on her Grandma’s farm in Ontario playing on the deck when she saw a family friend mowing the lawn on a tractor. Despite being told to stay on the deck, she ventured out to go say hi. “I was playing with my granny’s dog Max and I saw the family friend mowing the lawn and I wanted to go see him,” said Gottwald. The grass was slippery from a recent rain fall and Gottwald slipped and fell with her leg ending up under the tractor. She was airlifted to the Sick Kids Hospital in Toronto where doctors worked to try and save her leg. “The surgeons tried to save it for a good month they were working on saving it but then she got an infection and we had to make the decision, June 20 to amputate her leg,” said Gottwald’s Mom Denise Roussel. With the decision made, Gottwald’s leg was amputated and she spent the next nine months recovering in hospital. It was at this point at the War Amps stepped in with help and support for Gottwald and her family. “The War Amps give so much support to us they help to pay for her prosthetic limbs they support the whole family, they do so much,” said Roussel. That support helped get the family through a dark place after the accident. “As soon as Zoe had her accident we were just in…a dark place and we met the war amps, we call them our family, we saw how the kids were thriving and what they were doing,” said Roussel. During her recovery, Gottwald was in therapy to help her re-develop the muscle strength in her legs. Some of the therapy’s included swimming as well as balance exercises. As Gottwald recovery progressed she was eventually asked to be a safety ambassador by the War Amps. “My accident was all over the news and…they wanted me to be a safety ambassador and tell kids to play safe on farms and roads and like all that,” said Gottwald. She spoke for the first time to her junior kindergarten class when she was five-year-old. “She had her little leg and spoke with them, it was kind of light hearted,” said Roussel. This was followed by speaking to her entire school of 800 people in Grade 1. Since moving to Chestermere, Gottwald has spoken at Prairie Waters and East Lake Schools. In speaking about her injury, Gottwald works to find the balance between the unique challenges she has faced but also showing that while the amputation doesn’t define who she is, it has motivated her to do things she may never have tried. Among the challenges she faces is the continuing therapy and surgeries. “I just had a surgery recently in January because my bone was growing so they had to shave it down a couple inches,” she said. The problem is that as she grows, the bone is continuing to grow. Without the surgeries it could eventually poke out through the skin. “I’ve had six surgeries and I still have to have surgeries every time I grow a whole lot,” said Gottwald. She also needs a new prosthetic leg custom built and fitted whenever she grows since the prosthetics don’t grow with her. While it would be easy to just see the negatives and feel sorry for herself, Gottwald has instead turned her disability into a strength. “She doesn’t complain and that because they know hey I’m here I’m alive,” said Roussel. Gottwald has found particular motivation in her chosen sport, horse jumping. “I love jumping because it feels like I’m flying,” she said. Gottwald isn’t sure she would have ever discovered jumping if she hadn’t had the accident. She said they likely would never have moved out to Alberta. Having discovered her sport, Gottwald has excelled in it. She came third last year at Alberta Jumps. “She just does what every other kid does and she does this exceptionally,” said Roussel. Gottwald would like to go as far as she can in the sport. Ultimately, she’d like to compete at the Olympics. Jumping isn’t one of the sports in the Paralympics so Gottwald hopes to compete blaze her own trail in the Olympics. “I want to start jumping because there’s no one that I know of that jumps horses like that that’s amputee,” she said. Until then, Gottwald will continue to compete and continue to spread the PLAYSAFE message. She wants to help kids make smart decisions so that no one else has to go through the challenges she has. “You can’t just go ahead and think Oh I’m invincible and I can do whatever without getting hurt because that’s not reality,” she said. “You’ve got to think smart with your decisions because you’re not like Wolverine that can regenerate,” said Gottwald. For her part, Roussel is proud of her daughter and what she does to give back. “I like the fact that she wants to do it because she’s doing something to give back to them and just letting other children know to be safe,” said Roussel.